Joshua's train set is getting regular use, but he's keen for it to look more realistic - which means finding ways to hide the plywood and gaping holes between the levels. There's a lot of board to cover, and very specific size gaps to fill, so the Scalescenes retaining wall and tunnel mouth kits seemed the best option - as being economic and flexible. I printed out a couple of copies of each, bought a sheet of mounting card, and made a start at the front of the layout where the tracks pass by the high level station. The Scalescenes prints give an excellent finish - the colouring and detail is spot on. I used a laser printer which I think gives a more robust (damp and light proof) finish, albeit slightly shiny - though a coat of matt varnish could address that. However what you really get is a kit to make a kit - the print-outs need sticking to card and carefully cutting out before even starting assembly. This all takes time, is rather fiddly - and I'm never sure what glue to use. PVA can cause wrinkling, so I use Pritt-Stick on the sheets of paper - but it really isn't very sticky and can lift at the edges. At the other end the loop off the inner track cuts acutely under the station, making a very tricky spot to present realistically. I found some Wills vari-girder mouldings in the bits box, which made up a suitable looking beam. Supports, walls, and parapets were made up to fit and dressed with the Scalescenes prints to match the walls. The result works well, although the Voyager won't clear that innermost track! Thus the front of the layout looks much more realistic and is a good spot to watch trains go by. Now this is a train-set and is to be played with, so I haven't taken as much care in places that I could of to get edges sharp and disguise paper and card corners. However it's still taken me a good few weeks, on and off, to complete this 4-foot long wall and three tunnel openings, but there's a lot more of the layout needing walls and three more tunnels. I think I'm going to have to think of some short-cuts! Last weekend was Narrow Gauge South, held at Sparshotl, Winchester. 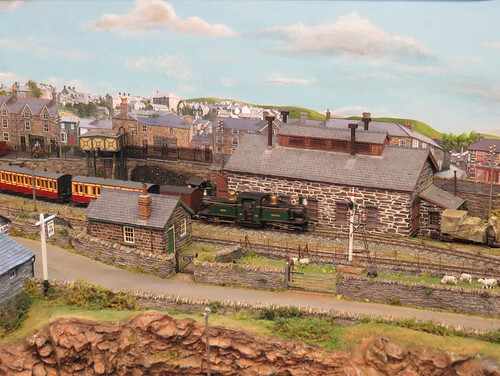 I was helping my friend Martin Collins with his layout, Llandecwyn. 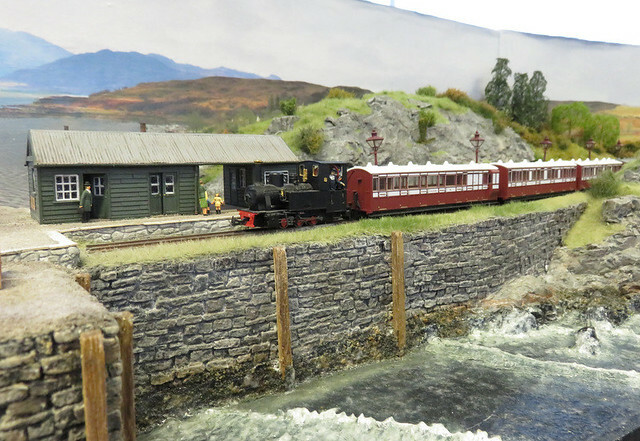 It's very much Ffestiniog inspired, though set in the next valley south, and features slate wharves, and gravity trains, with Double-Fairlie, small Hunslet and de Winton locos. It's not yet finished, and being primarily a home layout it isn't an ideal shape for exhibitions, but the quality of the scenery and stock is superb. 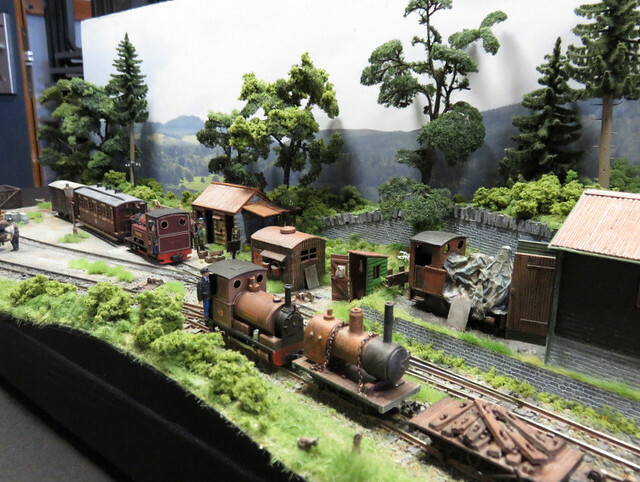 As usual the show is scattered through a number of class-rooms, which disguises it's size, as they contained nearly 30 NG layouts, as well as several specialist traders (and both 009 and 7mm NG society sales stands). The event hosted the 009 Society AGM, but I didn't go preferring to play trains and look at the layouts (it's the quietest part of the day!). 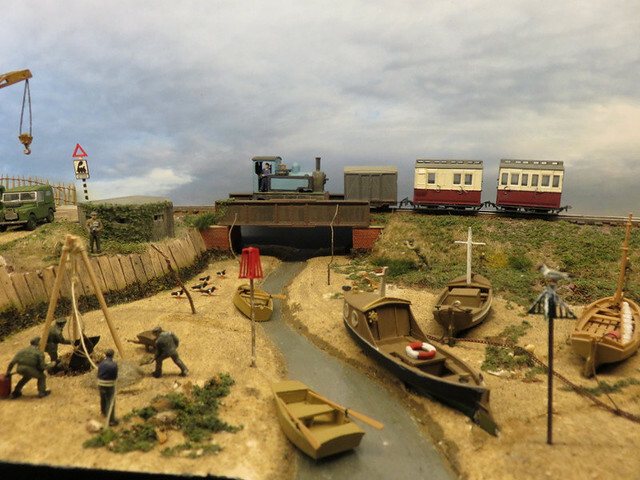 With such a selection it's tricky to pick highlights, but I do love the character and finely modelled stock of Tim Ellis' tiny Grindley Brook Wharf. 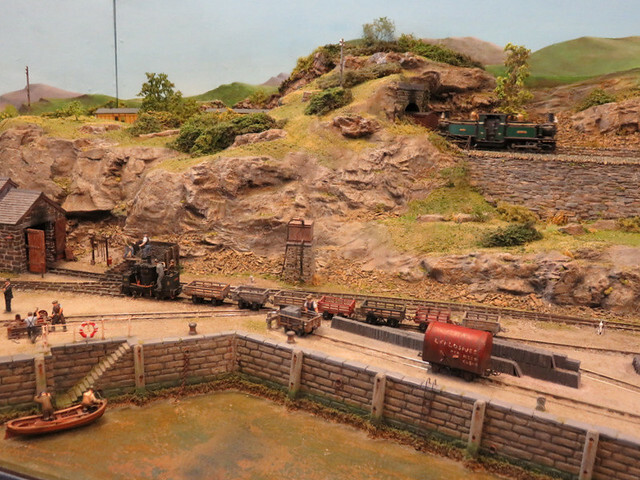 Chris O'Donohughe's Compass Point is another small layout packed full of detail, and atmosphere. And a little humour too. 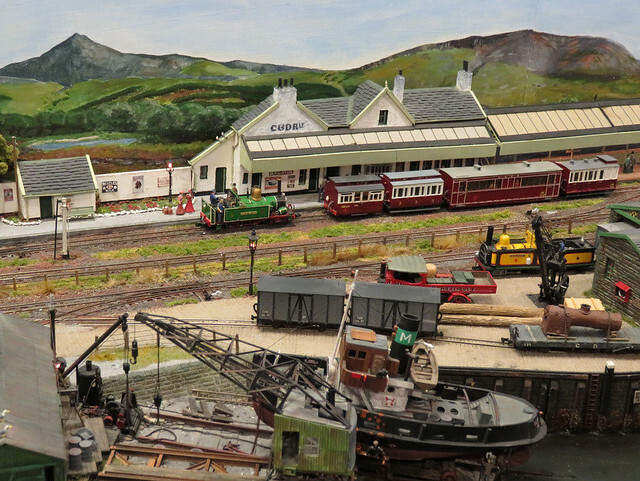 This was the last showing of Isle Ornsay for my friend Tom Dauben, even though it is not quite finished the scenery modelling is quite superb, but the layout has now been sold. Hopefully it will continue to be exhibited. However there was undoubtedly one layout of the show for me. I've been a fan of Ted Polet's Craigcorrie an Dunalistair - a slice of Scotland built in Holland - since I came across it in the Peco book of Narrow Gauge which I found in the Library when I was 11. This was the first time I've seen Dunalistair, and the last time Ted was showing it, so it was a real privilege. The modelling is to a high standard, but it is the cohesive nature of the layout (of which this is just a small part) with a fictional history, and a fleet of stock to match, that makes it a convincing example of freelance modelling, and such a popular model too. The harbour at Dunalistair is a particular feature, and as Ted spent many years at sea, it is superbly modelled. To see more photos - of Dunalistair and the rest of the show - click here. 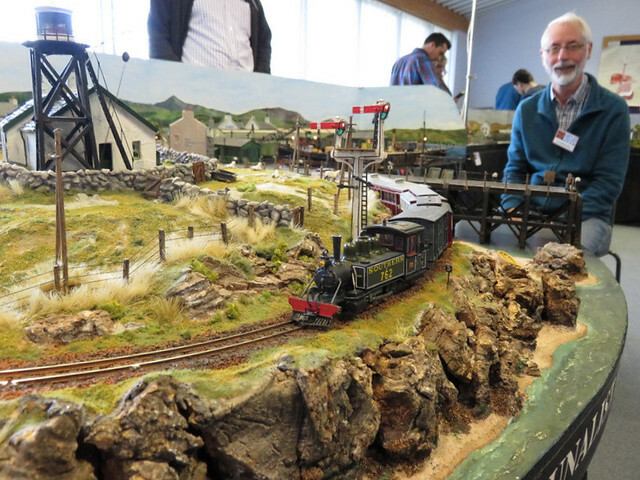 It was a short drive over the sunny South Downs hills to Steyning, where Thakeham was quickly set up at the Wealden Railway Group show. With the information board I think it made an attractive display, and being shown just a few miles from Thakeham a number of visitors were interested in the local connection. As usual, kids were fascinated by the "unloading" of the skips, and a few even had a go pushing the lever. I'm pleased to report the layout performed without issues. So does Simon Hargrave's tiny folding 009 layout, surely an answer to anyone believing they don't have space for a layout! It is superbly modelled and surprisingly uncluttered, given it's modest size. This nicely done industrial layout was shown by John Bruce, who I know better for small 009 layouts. Thunder's Hill was one of the larger layouts, a fine exercise in 3mm scale, modelled to a high standard. The station is reminiscent of the Sussex style, including those of the Bluebell Railway. That's just a taster, all the layouts were excellent, and you can see more photos here. As usual the relaxed show format - with a free hot drink for visitors - made for a friendly show.